HKEX Tech giants’ down round IPO, forerunner of consumption premium? Since HKEX shed green lights on dual class shares, tech tycoons from from China have created a “rush hour” with highest record of eight IPOs on the same day. However, vast majority of their share prices have fallen below IPO level since becoming public. This article will explore some of the rationales behind these down round IPO (the price or valuation of an IPO is lower than the price or valuation of private equity financing prior to listing), and how their real value could potentially be reflected by stock prices. Founded in 2010 by Wang Xing, Meituan which has been likened to U.S. discount platform Groupon Inc, offers a broad range of services including movie ticketing, food delivery, hotel and travel booking as well as ride-hailing. Backed by Chinese social media and gaming firm Tencent Holdings, Meituan raised $4.2 billion in the world’s biggest internet-focused IPO in four years as it priced the float near the top end of a marketed range, valued at around $52.8 billion. The proceeds will help Meituan fortify itself against stiff competition from its main competitor, food-delivery platform Ele.me which is backed by China’s biggest e-commerce company Alibaba Group Holding. Both parties, in a bruising battle for market share, are offering heavy discounts to attract new customers. The HK$69 IPO price represents a multiple of 27 times its 2020 profit forecast by its underwriting syndicate. As for cornerstone investors, Tencent committed $400 million; global asset manager Oppenheimer $500 million; UK-based hedge fund Lansdowne Partners $300 million; U.S. fund Darsana $200 million and state-backed China Structural Reform Fund $100 million. The Chinese company Xiaomi, established only in 2010, is now the world’s fourth-largest smartphone manufacturer by producing low-priced devices that have drawn comparisons — favorable and accusatory — to the iPhone. 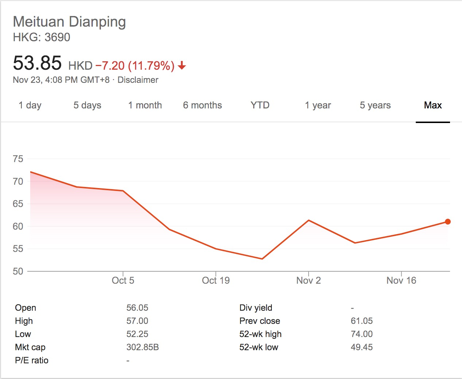 Its stock price has recently headed up after releasing third quarter earnings report, which shows the company’s revenue for Q3 was 50.8 billion yuan, representing a 49.1% increase year-on-year. The company also posted an adjusted profit of 2.9 billion yuan which is an increase of 17.3% y-o-y, which significantly exceeded market expectations. The financial report shows that Xiaomi’s growth in the last quarter has been a strong one, among which its overseas business, Internet of Things (IoT)/consumer goods and internet services business all grew rapidly. This holistic growth lends some credibility to the company’s posture as a complete internet company and not just a smartphone maker. 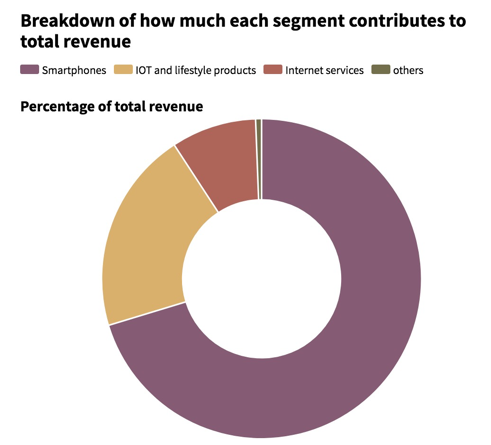 As part of its strategy to make the smartphone the center of a connected device ecosystem, its unique selling point was high-quality devices with top of the range specs, but at lower prices than competitors. Now it offers a variety of products, including smart TVs, speakers that rival the likes of Amazon Echo, Wi-Fi routers, appliances, air and water purifiers, and lighting. It also makes money from its own mobile games and advertising. From these two cases above, we can see the recent IPO companies have quite strong fundamentals, while the collapse of their market cap could be understood from the following three aspects. Dual class share stocks are banned from HK Connect thus people cannot access from Shanghai or Shenzhen Exchange. 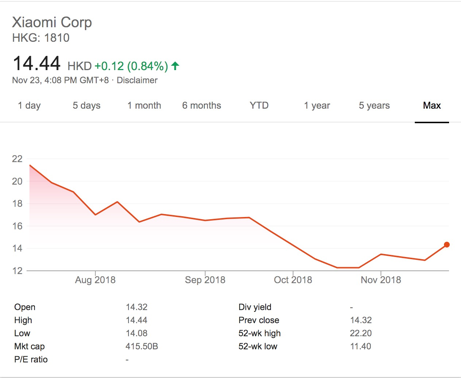 Xiaomi’s CDR (Chinese Depositary Receipt) plan of listing on A-share simultaneously was also suspended by CSRC (Chinese Securities Regulatory Commission) . International investors lack of understanding towards these companies’ establishment in China, such as brand value in consumers’ minds, manifested by Xiaomi’s positioning of IOT company encountering doubts from secondary market. As far as these factors are concerned, the companies still rushed for IPO mainly because of their bubbling valuation. When the amount of investment gained from PE rounds couldn’t be handed by majority investors, it left no choice but to go public for the initial investors to exit. Xiaomi’s first round investor Morningside venture gained 886 times its initial investment from the IPO. “Time will tell” for these tech giants. Even an outperforming stock such as Tencent, which almost takes up 10% of Hang Seng Index capital weight, also underwent several years of mundane performance in the beginning. From this instance we can see all these new economy companies would take up some time for them to well adjust value to international investors’ perception. The new Chinese economy trend, both as an endeavor to push consumption premium and to step out of the ever ongoing “made in China” stigma, represents the nation’s determination to achieve a more balanced economic composition.